I love The Rep in Birmingham. It’s a great theatre, with a noble history (as the civic Birmingham Repertory Theatre), and the staff are invariably helpful and friendly. But I’ve been disappointed recently to see that they’re using six seven “Heatstore” electric heaters (four pictured) outside the building. 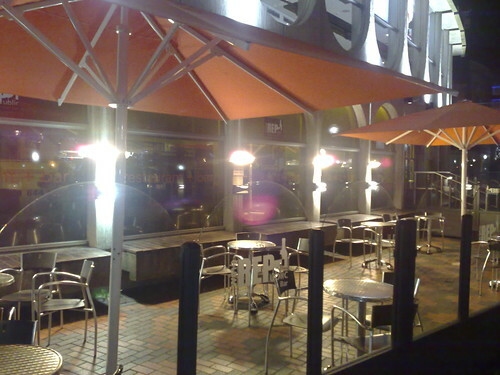 Every evening when I pass by there, the heaters are on, over empty tables, with no-one benefiting from them. This is madness, from an environmental and a financial point of view. I decided to let them know that I thought so, not least since Jon Bounds tells me that I’m good at complaining (I think he meant that as a compliment, and that any complaints I make are always well-founded and cogently-expressed, but I could be wrong…). The heaters actually belong to wine REPublic (see what they did, there?) the trendy wine bar within (and owned by) The Rep, so I phoned and spoke to their manager. He told me that they’re only [sic] on for three hours each night — we don’t use them during daytime (so that’s the equivalent of having one heater on for 75% of the time 21 hours a day, then), that they are low voltage [sic] and that we aren’t allowed to discriminate against smokers, we have to give them somewhere to smoke . Which leads me to ask the question, since when has discrimination against smokers been outlawed? Why have no pubs or wine bars been fined for doing so? And if smokers are protected, why are the Rep allowed to discriminate against them in the daytime, when the temperature is still below freezing? Who do you work for, again? The vCard (i.e. industry standard for business-card type contact data) and hCard specifications both cater for company (or organisation) names. So why, in the name of the Flying Spaghetti Monster (may his noodly appendages grace you), can I not find them, when I search my address book for “Acme Inc.”?!? And why can I not search for people by nickname? Nokia needs to fix this, and soon. 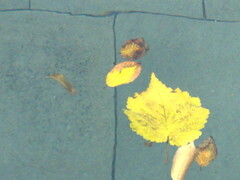 Here’s a picture of a leaf, floating on water. Having uploaded the picture to Flickr from my N95, and viewed it in my picture stream using the N95, it’s a pity I had to return to my desktop PC to post this, via Flickr’s blogging interface. Flickr: please make it possible to blog pictures from mobile devices.